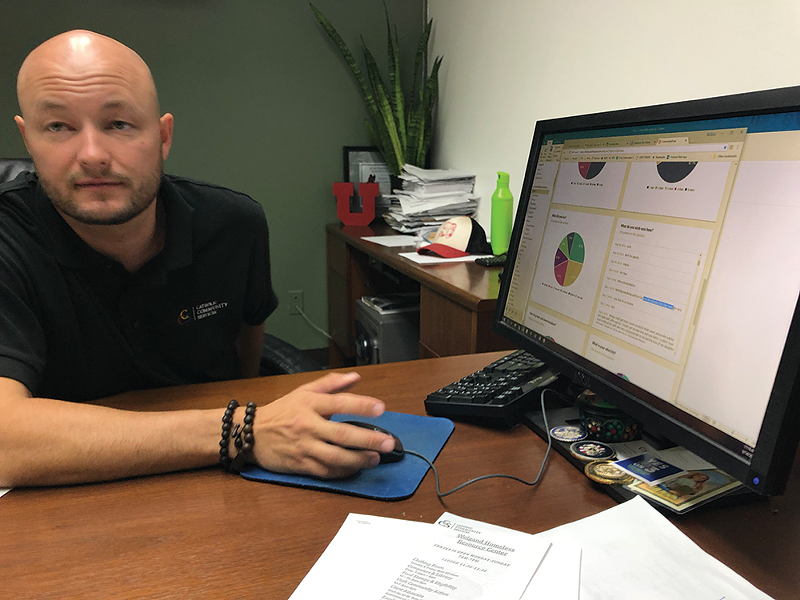 New digital survey gives homeless people a say in how five Utah organizations can better tailor their services. “We hold our clients accountable, there’s no reason why we shouldn’t be held accountable,” CCS’ Matthew Melville says. There haven't been doors on the bathroom stalls for the entire four years Matthew Melville has worked at Catholic Community Services of Utah's Weigand Homeless Resource Center. "Back when I started, we had to call the paramedics every day because of people overdosing," the director of homeless services says. The doors were removed and shower curtains taken from the showers to ensure that their clients didn't pass out in a secluded part of the day shelter. "For the sake of safety, some privacy was lost." A few homeless people who frequent the center weren't happy with the trade-off. In a digital survey offered on CCS grounds since July, several clients made the same request: more privacy in the bathrooms. Someone even suggested, as a compromise, installing partial shower curtains that cover bathers' bodies from their shoulders to their knees. There still aren't doors on the stalls, but CCS heeded the proposal and put the compromise curtain in the women's showers for a trial period. If things go well, Melville says, CCS will install permanent full-length curtains in the showers and toilet stalls. "We posted in the bathrooms, 'These shower curtains are a part of your feedback from the surveys. Please help us police it so this privilege doesn't go away,'" Melville says. "We want them to know that we're listening." CCS' new feedback system comes from Pulse For Good's homelessness survey program, started in January by six friends who work in the computer-software field. CCS and Valley Behavioral Health's Safe Haven are the only two organizations in Salt Lake City currently administering the digital questionnaires through iPad kiosks or in their computer labs. Ogden's Lantern House, St. George's Switchpoint and Logan's Neighborhood Housing Solutions also are all using PFG software to receive feedback. "It gives organizations a pulse of how satisfied people are with their care," PFG co-founder Blake Kohler says of his company's punny name. "Most service providers have been trying to do this by hand over the last 30 years." The services are costly—a one-time $5,000 charge installing hardware and creating the survey, and a $10,000 annual subscription fee, though discounts are available. Kohler says PFG offered the survey for free to every social service provider in the state, but only a few accepted. Several organizations, he says, told him they didn't want to expose themselves to potentially negative feedback. "They were worried, I think, they would lose funding if they had bad scores." Kohler hopes that, eventually, local or state governments, or sponsor foundations, foot the bill so service providers don't have to pay. Each survey consists of at least five questions that ask respondents to rate, on a five-star scale, their overall level of satisfaction with their stay, the facility's safety and cleanliness and the quality of their interactions with staff members. There's also an open-ended question where clients can provide more feedback and suggest improvements. PFG owns the data but shares results with homeless organizations, which then can tailor their services accordingly—like CCS did with the shower curtains. PFG can also customize each providers' survey, should the staff wish to collect additional data. CCS' poll includes additional questions that ask respondents for their gender, ethnicity, age, marital status, how long they've been homeless and which services they utilized. As of Sept. 28, 535 people have taken the questionnaire from CCS' computer lab or iPad kiosk since PFG installed the technology. According to a mid-September breakdown of the responses that Melville showed City Weekly, respondents gave CCS a 4.2 out of 5 overall rating. Around two-thirds of people gave CCS a five-star rating for safety and staff friendliness, and just more than half gave the shelter five stars for cleanliness. More than half of those who responded had been homeless for a year or longer, and nearly a third were age 50 or older. Melville says he's surprised by the number of five-star ratings. "If you're here, you're at your lowest level in life. You've been through something traumatic." There's no limit to the number of times someone can take a survey. Melville says he hopes people take it more than once, so he can see if satisfaction levels change on different days of the week or, eventually, over different seasons. "I want to be able to track your experience," he says. "I don't want a snapshot." Rep. Steve Eliason, a longtime board member of the social service agency The Road Home and a Republican state representative from Sandy who regularly sponsors legislation that involves homelessness, says it's important to gather feedback on support services, but cautions that such results should be taken with a grain of salt. "By design, emergency homeless shelters are not typically designed to be like a bed and breakfast because the goal is to help people transition as quickly as possible to housing," he says, adding that "the clientele are in very difficult positions in their lives, and so you need to take their frames of mind into account when you evaluate the results of a survey." Melville says PFG's services supplement CCS' weekly client engagement meetings, where staff talk with clients at length about survey responses and other needs they might have. He suggests the polls are helpful for aggregated data and gauging client's general perceptions about CCS, but the weekly meetings are better for analyzing necessities on a deeper level. "You really have to do both," he says. David Christopher Thomas and Troy Engle sit at a black-and-white table in the courtyard outside the Weigand Center on a hot Friday afternoon. Thomas says he took the survey three times in one day because he wanted to improve his chances in a raffle for a $20 gift card to Panda Express. He gave CCS five-star marks on everything, and he asked for help getting a better job and place to stay. But he isn't sure his suggestions will lead to any change. "It goes in one ear and out the other," he says. Engle rolls cigarettes as he sits beside his friend. He took the survey so he could ask for more port-a-potties on the grounds outside Weigand, since the ones there now are frequently filled with people who passed out after doing drugs. After submitting his responses, he learned that the portable toilets are the city's responsibility, not CCS'. His request proved moot, but Engle says he might take it again for one simple reason: "I'm trying to improve this place."